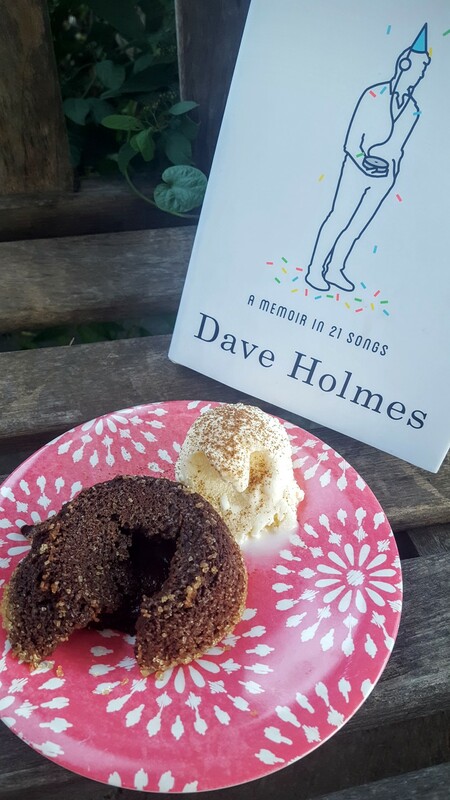 Written by the perpetual uncool kid that was always looking in, Dave Holmes writes a hilarious and insightful look into not only his psyche but also into the music of “the last forty years” (and the pop culture) in Party of One. There are so many opportunities for the younger Holmes to embrace a peer group (and himself). There was a creative writing summer course when he was in high school. There was his time in college as a founding member (and catalyst) for a gay and lesbian support group (“alas, the B and T were not yet invited to the party”) on his conservative Catholic campus. It took Holmes a long time (and 21 songs) to find out that not fitting in is in fact a niche unto itself. This book is not all about teen or young adult angst. As Holmes writes about his foibles, trials, and tribulations, he is hilarious. More than once, I found myself laughing out loud. Truly. Holmes’ writing style reminded me of a younger and much more self-deprecating David Sedaris (whom I find pee-my-pants hysterical). Every so often, Holmes interjects an interlude. These are usually more associations with the songs of the era and more pop culture. Even though Holmes is about five years younger than me, I found myself identifying with the heartache, longing and emotion that some of these songs stirred in me as a young adult. Then, it happened. As I read about Holmes during his mid-twenties in NYC, I started having to Google everything. When you’re young, you think you’re always going to know every song in the Top 40. You feel pity for the old people who have to ask you what’s playing on the radio. If you think about their tastes at all, you assume they’ve always been this out of touch. Incapable of keeping up since forever. Old even when they were young. And then one day it happens to you. It happened to me about halfway through the book. Although I enjoyed reading about his days at MTV and his subsequent forays into acting in LA, I definitely felt like someone who was never hip. I loved the first half of the book. I was too busy Googling during the second half. It was hard to keep up. I also found some of Holmes’ escapades a bit suspect toward the end of the book. Party of One opens with a T.S. Eliot allusion in the first few pages from Frank Turner’s song, “I Knew Prufrock Before He was Famous.” How ironic as Holmes spent his adult formative years asking himself “Do I dare to eat a peach?” Perhaps he should have embraced himself like the Bee Girl of Blind Melon’s “No Rain” video. But, if he had done that in 1992, we would not have this hilarious and poignant memoir. If you were under the age of 30 during the 90s, love pop culture, or need a good laugh, I think Party of One will at least make you smile while remembering those times where every song spoke directly to you. Preheat oven to 400 degrees. Generously butter 6 cups of a standard muffin tin. Dust with trubinado sugar, and tap out excess. Set aside. In the bowl of an electric mixer fitted with the paddle attachment, cream the butter and granulated sugar until fluffy. Add eggs one at a time, beating well after each addition. Add cinnamon. With the mixer on low speed, beat in flour and salt until just combined. Beat in chocolate until just combined. Divide batter evenly among prepared muffin cups. Since the turbinado sugar gave the outer surface a very satisfying texture, I chose not to dust these with powdered sugar. Instead, I served one scoop of vanilla ice cream on the side and dusted it with a bit of cocoa powder. I could surely get fat livi near you always wanting some. Of the goodies you prepare! Yes to cake! I would have to start walki more. This summer has been so unbearably hot I think it’s hit people across the nation. I have been awful about my daily walks. Great review, I saw this one and wondered if I’d like it, must give it try. Finally, I think it might be cooling off a bit (so I mean it will only be 88 degrees next week). If you lived next door, I would gladly share the calories. Sounds like a good read, Debra. The molten cake looks very inviting! Thank you, Angie. It was hilarious. When I thought about it – that molten chocolate cake was all the rage during the 90’s. I remember ordering it at Bennigan’s! 🙂 I wonder if they still have those places? Anyway, sounds like a great book and the recipes looks superb! Yep it was. I wonder who is credited with inventing it? Are there still Bennigan’s? I thought I saw one in Edmond out by Quail Springs….that might have been a long time ago. We had a friend who LOVED the Monte Christos there. Well, the time frame fits. Thanks, Mae. 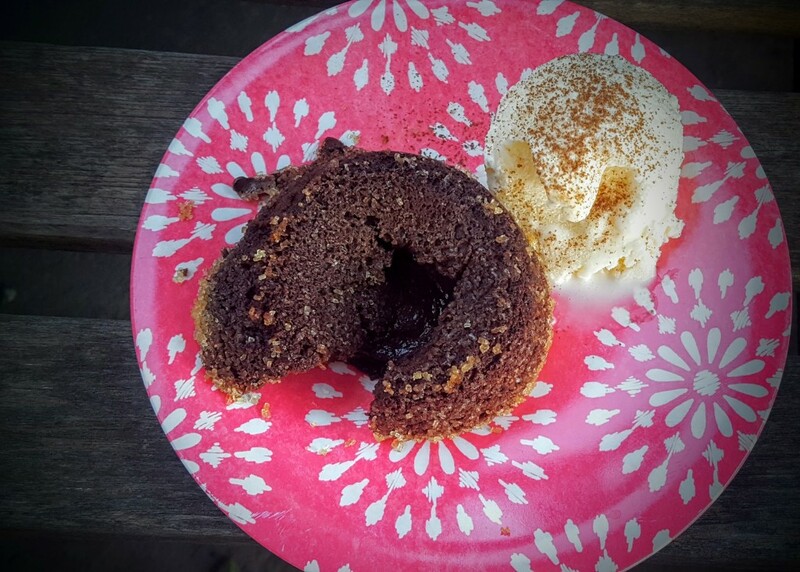 Your molten cake looks delicious, I’ve never made one, but the chocoholics here would love it! The book sounds like an interesting read. I forgot how good these are. The leftovers are remarkably great just heated up a bit in the microwave. My best friend and drove our teachers and parents nuts I am sure because our career goal for some time was to become a VJ. Sigh, indeed. Love cinnamon. And haven’t had a molten chocolate cake in ages! Music in the 80s was good — so this sounds like a fun read. Thanks! I might learn something reading this book. I grew up listening to the music of the 60s and 70s so when the 80s come, I just couldn’t change my tune…so to speak. 🙂 Need to check out your other Goodreads reviews. You know I have never had a molten lava cake. You pictures make me want to change that. Looks awesome!